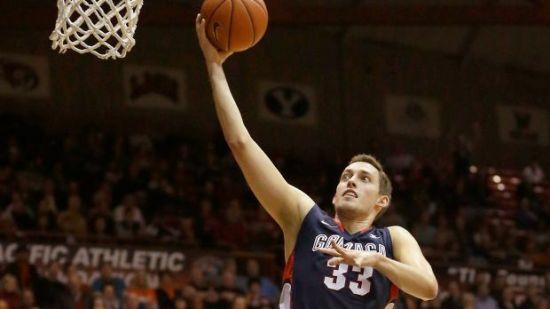 Betting action for the weekend in college basketball ends with two Sunday games involving Pac-12 and ACC teams. Miami hosts Clemson in ACC action, while USC is on the road against Stanford. Clemson has put together a run of 4-0 straight up and 3-1 against the spread in its past four games overall. The Tigers defeated Florida State their last time out 62-56, as a road dog by 2.5 points. The total has cashed UNDER in seven straight games for Clemson. Miami is below .500 in conference play. The Hurricanes are 0-3 SU and ATS in their past three games overall, including a loss on Tuesday to Louisville 63-55 as a home dog of 4.5 points. Clemson is 4-1 ATS over its past 5 games on the road and 5-1 ATS in it past 6 games versus an opponent with a winning record straight up. Miami has not covered in 4 of its past 5 games at home and is 0-3-1 ATS during its past 4 games after a loss straight up. The total has cashed UNDER in 16 of Miami’s past 21 home games. 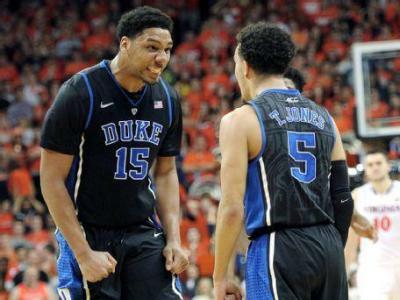 The underdog is 12-3-1 ATS in the past 16 games between the two teams. The total has cashed UNDER in 6 of the past 8 games between the two in Miami. Over the past 6 head-to-head games, the series is 3-3 SU, with Clemson 5-0-1 ATS. USC is buried at the bottom of the Pac-12 conference standings with a 1-9 SU and 5-5 ATS record. Thursday night as a road dog of 7.5 points, USC covered in a one-point loss to Cal. The total has cashed on 4 of the past 7 games for USC. One bright spot for USC has been Jordan McLaughlin a freshman guard who scored 20 points and pulled down 5 boards in Thursday’s loss. Stanford trails Arizona by three games in the Pac-12 race at 6-4 straight up and 4-5-1 against the number. 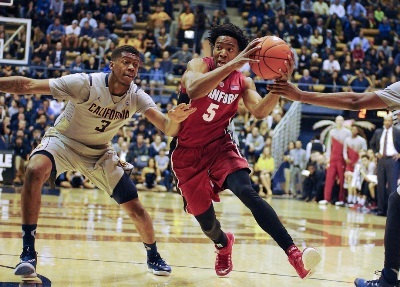 Stanford is 0-2 SU in its past two games versus UCLA and Washington State. USC is 6-2 ATS in its past 8 games on the road and 9-3 ATS in its past 12 games away from home versus a team with a straight up home winning record. The total has cashed OVER in 4 of USC’s past 5 games played on Sunday. Stanford is 9-3-1 against the number in its past 13 games versus a team with a losing record straight up and is 4-2-1 against the number in its past seven games at home. 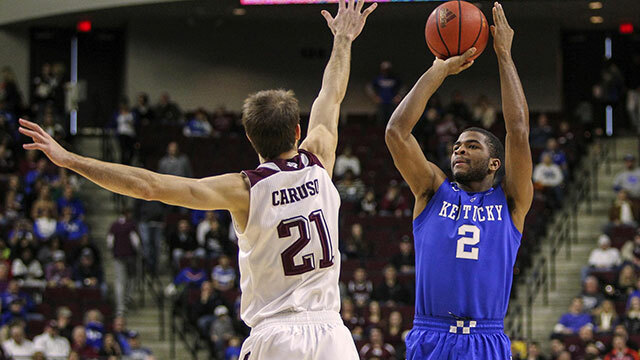 The total has cashed UNDER in 8 of its past 11 games played at home. Monday night, the inaugural College Football Playoff Championship Game, will kick off from AT&T Stadium in Arlington, Texas. 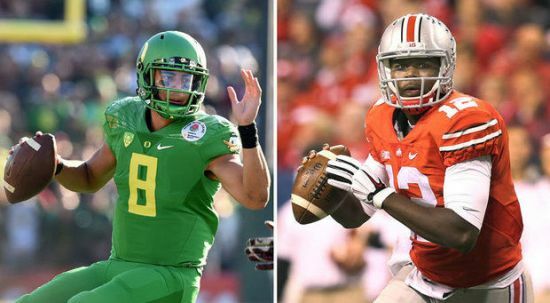 The Oregon Ducks led by Heisman Trophy winner Marcus Mariota will face the Ohio State Buckeye led by quarterback Cardale Jones. In its semifinal game, Oregon defeated the Florida State Seminoles 59-20, easily covering the spread. At the same time, Ohio State defeated Alabama 43-35, winning outright as an underdog. The last time the two teams met was in the Rose Bowl in 2010 with Ohio State winning 27-16 and covering a 4.5-point spread by winning outright as the underdog. This is the first time in eight seasons that no SEC team will by for the national championship. Oregon on the season is 13-1 straight up and 10-4 against the spread. Ohio State is 13-1 SU and 9-5 ATS. The over-under for Oregon this season is 7-7 and for Ohio State 12-2. Oregon is 9-0 SU and ATS, since is only loss earlier in the regular season to Arizona. In each of the 9 games, the Ducks covered a spread of seven points or more on eight occasions. According to Bovada and betonline, Oregon is 5-1 SU against schools from the Big 10 since 2007. Ohio State ended the season with a run of 8-3 ATS and since 2007 is 13-2 against the number while an underdog and covering six straight when receiving 7 points or more. According to topbet and sportsbook.com, the line opened at Oregon -6.5 and has fluctuated between there and -7.5 the past 10 days. The point total opened at 72.5 on most sites, but has gone as high as 75. Offensively, Oregon has the nation’s No. 2 offense scoring 47.2 points per game against the No. 27 ranked defense of Ohio State that is allowing 22.1 points per game. 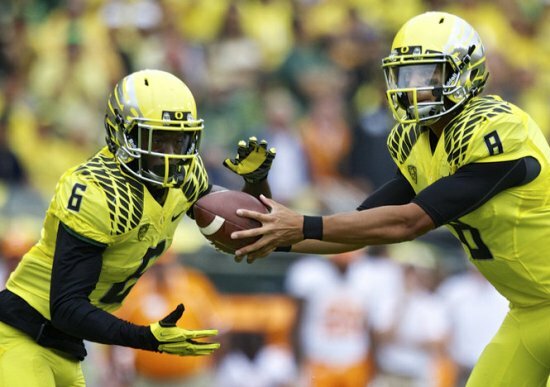 The Ducks passing game averages 311 yards a game, while the Buckeyes allowed 191.5 yards per game through the air. Ohio State has covered the spread in 8 of its past 12 games overall. Ohio State has won 5 consecutive games straight up. Oregon is 4-0 against the number in its past four bowl games. The OVER has cashed in 12 of the past 13 games played by Ohio State. Both teams will score and often. The OVER even though it seems high, looks to be a good play. Between the teams, they average 92 points per game, which should make for fireworks on the offensive side. The Ducks do not matchup as well with Ohio State as they did with Florida State. The spread seems high. I like the OVER and Ohio State covering. The Rose Bowl in Pasadena, California will kick off the first ever College Football Playoff when the Florida State Seminoles meet the Oregon Ducks. The last two winners of the Heisman Trophy will be facing off against one another in this highly anticipated national semifinal matchup. Florida State is unbeaten at 13-0 this season and 29-0 in their past 29 games played, but enters this game as a 9-point dog against the 12-1 Ducks. This is because the Seminoles have not been anywhere near as good this season as they were last. Over their past 14 games played, the Seminoles are 3-11 ATS. In addition, Oregon has won its past 8 games by an average of more than 26 points and covered the spread in each of them. The Seminoles are 29-0 straight up and 15-14 against the spread in their past 29 games played. The Seminoles are 8-1-1 against the number in their past 10 bowl appearances, while going 8-2 straight up in the same 10 games. The UNDER has cashed in each of the past 3 games Oregon has played and 5 of the past 6 bowl games the Ducks have played in. Preparing for the country’s most dangerous offense takes time, and the Seminoles have had it. However, the defense for FSU has been unimpressive the entire season and could use every piece of help they can get when facing Oregon. This matchup features the newly crowned Heisman Trophy winner Marcus Mariota the quarterback for Oregon and Jameis Winston the 2013 Heisman Trophy winner the starting quarterback for Florida State. Statistically the years each won the Heisman were similar. However, Mariota is more of a dual threat as he rushed for 669 yards and scored 14 rushing touchdowns on the season. 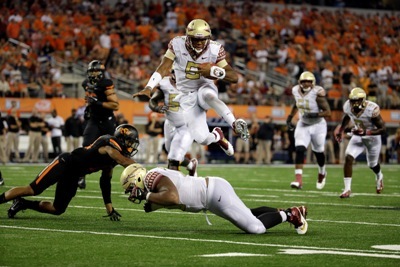 However, Florida State has not lost a game with Winston at quarterback and is 26-0 in his two seasons. 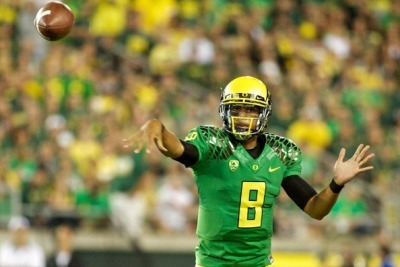 Oregon is 35-4 in the three seasons that Mariota has quarterbacked the Ducks. The weather should not be a factor as it is expected to be sunny and in the 50s in Pasadena. 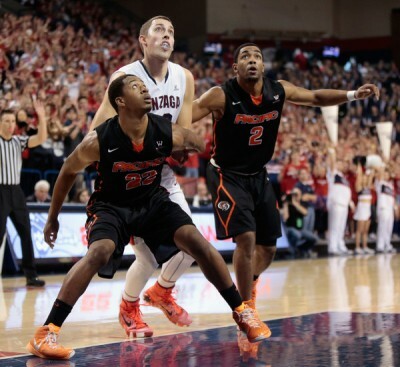 Oregon has won as well as covered 8 straight games since their only straight up loss this season to Arizona. However, Florida State has covered the spread in just 1 of its past 5 games played. The Seminoles have seen their rating fall 10 points since the start of this season, which for an undefeated team is unheard of. 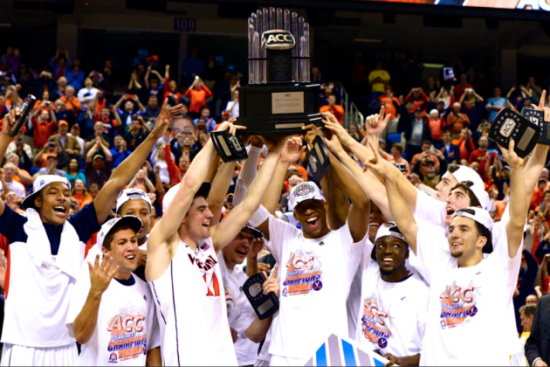 However, 9 points or more is a great deal to give a team that has won 29 consecutive games. FSU has been involved in close games the entire season. They are 7-0 in games that have been decided by 6 or fewer points. 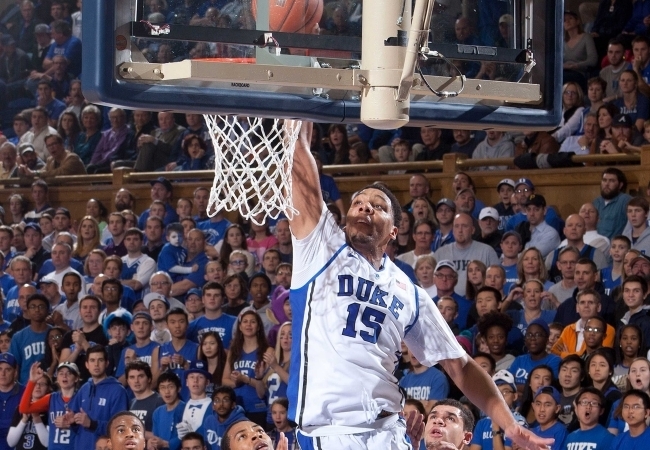 They come in battled tested and even though they are getting 9 points, they could win outright. The North Carolina State Wolfpack will face the Central Florida Knights in the Bitcoin St. Petersburg Bowl on Friday, December 26. During the regular season, North Carolina State was 7-5, while Central Florida was 9-3. The current line has Central Florida favored by 2.5 points with the point total sitting on 49. The last time we saw UFC, the Knights stormed the field Hail Mary catch from Breshad Perriman was completed to beat East Carolina. 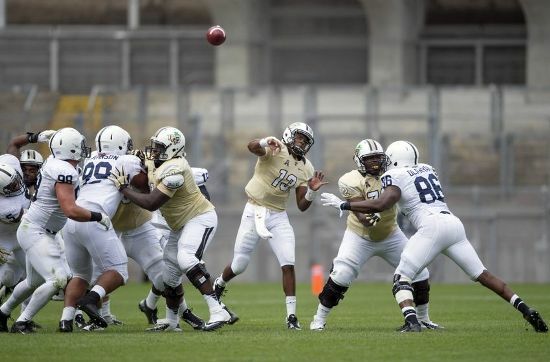 That win helped UCF claim a three-way share of the American Athletic Conference title. The win is what helped the UCF team to earn a berth in this bowl game against the Wolfpack, which has won 3 of its past 4 games. The teams split their 2 previous meetings, with NC State enjoying a 28-21 win back in 2010. While UCF seeks its 4th consecutive victory, North Carolina State returns to bowl action following a disappointing 2013 season where the team was 3-9. The Knights have one of the best defenses in the nation, which is led by Terrance Plummer a linebacker and Jacoby Glenn a cornerback, who is tied for No. 3 in the nation with 7 interceptions. Plummer has 92 tackles, which is a team-high for the Knights. UCF is allowing only 17.5 points per game. UCF’s strong defense will be tested by the Wolfpack offense that easily outscored its previous 2 opponents. The Knights defense is ranked No. 5 in the nation against the rush, but NC State rushed for 388 yards in a victory over the North Carolina Tar Heels in the final game of the regular season. Shadrach Thornton has 161 yards rushing on 28 attempts to lead the Wolfpack in their win over UNC. After leading during the first quarter 24-7 against Florida State on September 27, the Wolfpack fell apart and lost, and followed that loss with two more consecutive losses. 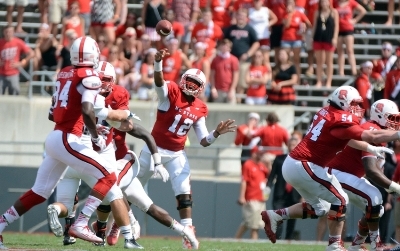 Jacoby Brissett the Wolfpack quarterback is the owner of a 22-to-5 touchdown-to-interception ratio this season. He has also run for 498 yards and 3 rushing touchdowns. The Wolfpack defense is led by Mike Rose who has recorded 14 tackles-for-a-loss to lead a defense that allowed only 15.7 points in the team’s 7 victories. The Knights opened their regular season with losses against Missouri and Penn State before 5 consecutive wins, including a victory against BYU in overtime 31-24. While their defense has stood out this season, the offense had its problems scoring prior to averaging 33 points during its 4 games winning streaks to close the regular season. Justin Holman the Knights’ quarterback has thrown for 20 touchdowns while giving up 13 interceptions. 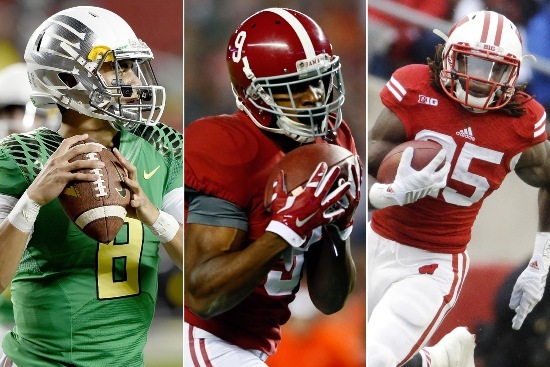 The Heisman Trophy chase is coming to an end. Three finalists have been named and Marcus Mariota the talented quarterback from the Oregon Ducks is far and away the favorite. During the chase for the Heisman this season, many players came upon tough times that made them fall off the pace. 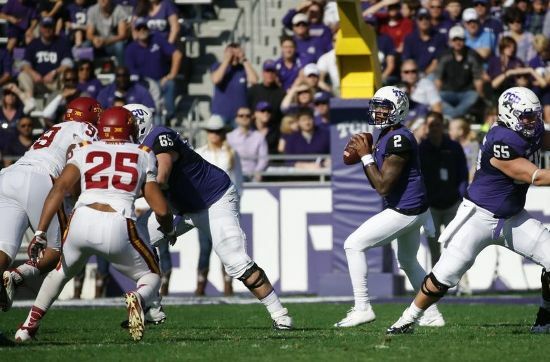 Kenny Hill the quarterback for Texas A&M had the second-best odds on Bovada and topbet during late September. However, he ended his season as the backup quarterback for the Aggies. Dak Prescott the signal caller for Mississippi State was one of the three top contenders for over two months. However, he lost his chance after suffering three interceptions in a loss to Alabama. Jameis Winston the reigning Heisman Trophy holder could not stay out of the news for incidents off the field and unrelated to football and was intercepted 17 times while on the field. Usually four and at times five players are selected as finalists and invited to the ceremony in New York City. However, this weekend only three will be in the Big Apple for the announcement. The Oregon quarterback is -900 chalk. If he does not win, it would be a huge shock. The junior quarterback led the Ducks to the College Football Playoff as the No. 2 seed. Mariota has completed 68% of his passes, thrown for 3,772 yards and has 38 touchdowns passes to just 2 interceptions. Mariota also had 669 rushing yards and 14 rushing touchdowns. The talented wide receiver for Alabama is 20 to 1 to win according to betonline and sportsbook.com. Cooper, in three seasons has shredded the receiver’s record book at Alabama. He has helped the Crimson Tide to the No. 1 seed for this year’s College Football Playoff. In three games, he had 200 or more yards receiving. He caught 8 or more passes in 11 of the team’s 13 games. He ended the regular season with 115 receptions. The running back for Wisconsin is 25 to 1 to win. Gordon was huge down the stretch. However, his team lost in the Big 10 championship. Gordon broke the NCAA single game rushing mark with 408 yards rushing against Nebraska in only three quarters of playing. He had 122 yards or more in 11 of the team’s 13 games. He ran for 5 touchdowns in one game. His 2,336 yards led the country. He added 26 touchdowns. However, Mariota has performed at a high level in each of his team’s game this year. Even in a losing effort earlier in the season to Arizona, Mariota played well and was able to avenge that loss in last week’s Pac-12 championship by routing the Wildcats 51-13.